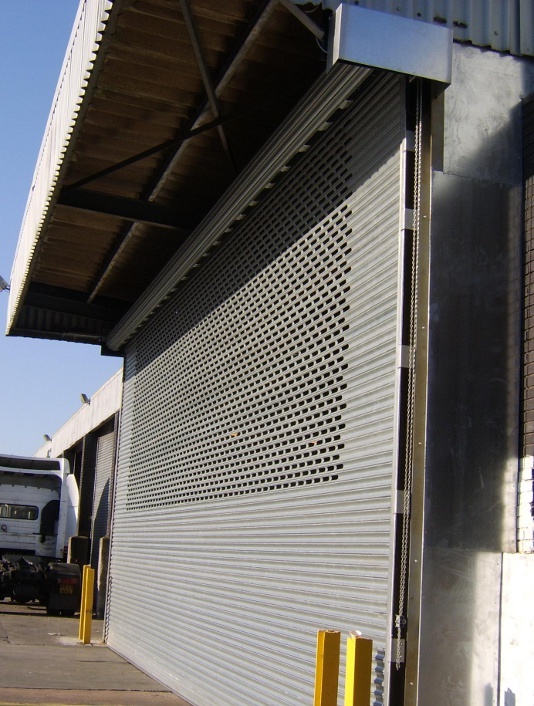 Constructed of rust resistant galvanised interlocking slats cold-formed to an accurate profile, interlocked to present a uniform faced curtain. 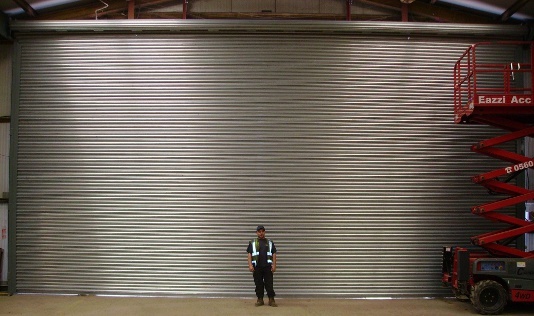 Alternate slats have riveted endlocks to prevent lateral movement. Supplied complete with a reinforced bottom rail. Steel channel guides are mounted on angle iron securing brackets to give necessary support. 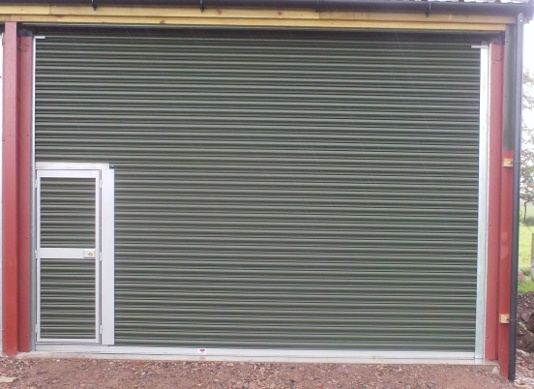 Constructed from seamless steel tube fitted with internal helical springs of hard drawn steel wire, wound to a maximum diameter and assembled into the roller without stretching or pre-stressing. Bright steel shafts run in ball races, and are strong enough to give full support to the bearings to resist the torque of the springs. The whole roller is greased and sealed before despatch, and comes complete with the necessary supporting brackets. Can be supplied in galvanised sheet steel, ready for painting by customer. The hoods are intended to cover the rear of the coil, but the gear and the motor can also be covered. By hand chain or pole-and-hook. Through machine-cut gears. Electrical equipment includes drip-proof enclosed squirrel-cage motor with integral gear box and magnetic brake (400/440 V – 3pH -50c supply). Reversing on line starter with overload protection and push-buttons marked ‘UP’, ‘DOWN’ and ‘STOP’. A geared limit switch controls curtain travel in each direction. 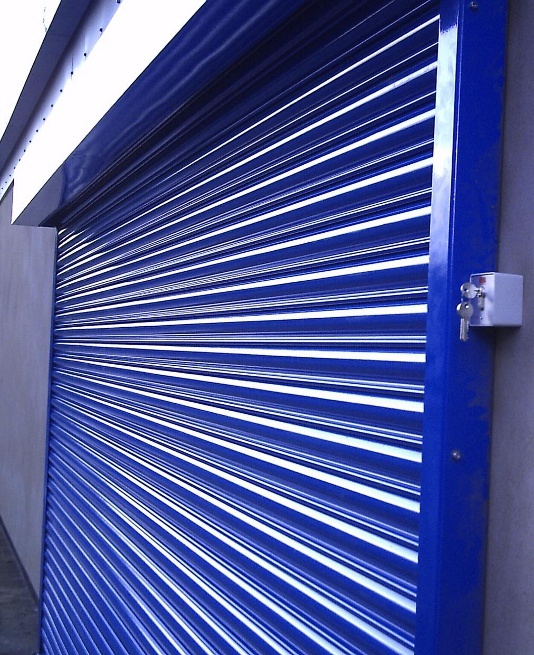 An independent emergency hand chain is fitted to the shutter gear bracket for use in the event of power failure. 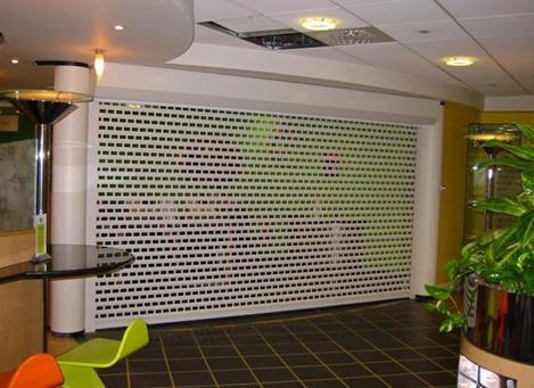 A chain anchor fixed to the wall at an accessible point prevents the operation of the shutter when secured. Other locking devices are available. The positions generally chosen are: outside face of lintel; inside face of lintel; under lintel guides at front of coil; under lintel guides at rear of coil. This is an optional feature. The standard size is a big 5’9” x 2’3” wide, and other sizes can be made to order. They are of rigid frame constuction filled with lath section to match the curtain frame material. The steel framework is supplied primed and ready for painting.